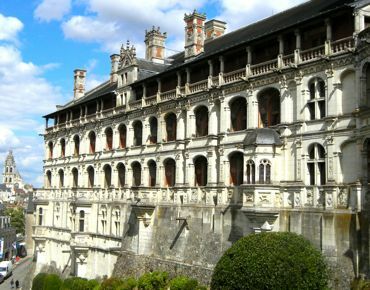 The large Château Royal de Blois includes four distinct wings, from medieval to the 17th century, and provides a variety of architectural history. The Château Royal de Blois, overlooking the town of the same name, provides a great overview of royal history and architecture in France. 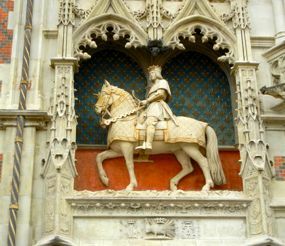 A statue of Louis XII on horseback greets you on the main facade. You enter via a large courtyard, with a view of all four wings. As you look around, the staircase tower in the François I wing stands out, and seeing people on it you realize you'll be climbing that during your visit. The Medieval Fortress focuses on the large Hall of the Estates General. From here you pass through the old kitchens, now housing sculptures and carvings from the château. Climbing the François I staircase, you then enter the royal apartments. Over the years, these apartments were occupied by François I, Catherine de Medici, and Henri III, among others. Restorations focus on the fleur-de-lys, symbol of French royalty, and the salamander, emblem of François I, appears frequently. The magnificent King's bedchamber is said to be where the Duke de Guise was assassinated while planning a coup d'état against the King in 1588. The Louis XII wing is today a Fine Arts Museum, with many portraits and other paintings and sculptures. Throughout this you will occasionally see the porcupine, an emblem Louis XII is said to have inherited from his grandfather. It fell out of favor as too militant and aggressive, but the sight of a crowned porcupine is worth noting. After visiting the château, be sure to take a look at the small Saint Calais chapel. And then continue your walk to the ramparts and the Tour du Foix for some beautiful views of the Loire River and the town of Blois, including Old Blois and the St Nicolas Church. Afterwards, cross over to the Jardin des Simples et des Fleurs Royales to enjoy the gardens and a wonderful view of the Façade des Loges, the exterior part of the François I wing. Blois offers much more than the château, and you'll want to spend some time exploring the narrow streets of Old Blois. If you're interested in magic, just across the Place du Château is the Maison de la Magie Robert-Houdin. In the summer season, the château also offers a Sound and Light Show that presents famous episodes in the Château's history. And if you want to visit more châteaux in the area, Blois is not far from Chambord and Cheverny. 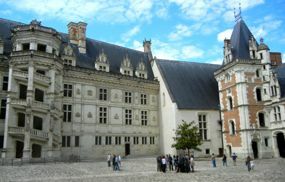 Above, Courtyard and Staircase, Château de Blois, France. 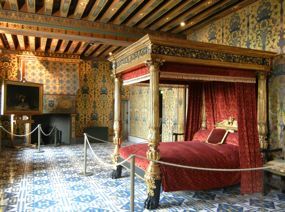 Below, King's bedchamber, Château de Blois. Above, King Louis XII, facade of the Château de Blois, France.